VietNamNet Bridge – Viet Nam needs to restructure its rice production based on demand and supply and focus on improving farming techniques, procurement from farmers, and preservation. Dry rice is loaded onto a ship in the southern province of Tien Giang. The country has exported 4.67 million tonnes of rice for US$2 billion in the first eight months of the year, a reduction of 7.86 per cent in volume and 10.9 per cent in value year-on-year. The opinion was voiced by Deputy Minister of Industry and Trade Tran Tuan Anh at a seminar in HCM City yesterday (Sept 12) on adding value to the country's rice exports. Anh said in recent years big exporters like India have resumed exports while importing countries have increased domestic output, resulting in a global glut. "As a result, prices have fallen sharply since last year," he said. The event, organised by Vietnam Economic Times newspaper and the Viet Nam Food Association, gathered more than 250 State officials, scientists, and business executives. Though Viet Nam's rice exports have surged in recent years, farmers' incomes have not. Agriculture is plagued by problems like small scale of production, inconsistent quality, lack of branding for rice, high production costs, and volatile prices. Dao Nguyen Cat, editor-in-chief of Vietnam Economic Times, said the country still lacks a good strategy to raise the value of Vietnamese rice in the global market. Nguyen Van Luat, former director of the Cuu Long (Mekong) Delta Rice Research Institute, said advanced technologies should be used to improve productivity and quality and, thus, farmers' incomes. Delegates also highlighted the need to develop large-scale rice cultivation areas, strengthen links between rice producers, scientists, authorities, and traders, especially farmers and traders. Large-scale fields and closer co-operation among the stakeholders would enable high output and uniform quality, Le Minh Truong, director of Song Hau Food Company, said. Some localities who have been working on this said the profit per hectare is higher than from traditional fields. Ensuring outlets for farmers is even more important, Vu Trong Khai, former rector of the School for the Agriculture and Rural Development Management Cadres, said. "Closer co-operation is needed between enterprises and farmers during the entire process of rice production," he said. Torsten Velden, country head of Bayer CropScience Viet Nam – the event sponsor – outlined a four-point plan to improve rice farming and farmers' livelihoods. He listed them as leading innovation to address the key challenges of rice farming through new and modern solution; enabling farmers by providing them with tools, technology, and training; raising agricultural productivity in an environmentally compatible and sustainable manner; and expanding partnerships across the rice value chain and between the public and private sectors. Investing in agricultural research is the most productive way to support agricultural growth in the long term, he said. "At Bayer Cropscience, our relationships with farmers go beyond the product delivery point – to provide a package of integrated services including training, education, as well as stewardship and other advices," he said. This is pertinent in Viet Nam where most farmers are small and do not receive the support, training, and technology they need. Pham Van Bay, the VFA's deputy chairman, said the country has exported 4.67 million tonnes of rice for US$2 billion in the first eight months of the year, 7.86 per cent down in terms of volume and 10.9 per cent in value year-on-year. With supply outstripping demand, rice exporters have faced considerable difficulties this year. Recently the Thai government decided to slash rice prices to liquidate its stocks, affecting the rice market in Asia and posing a greater challenge for Vietnamese exporters. 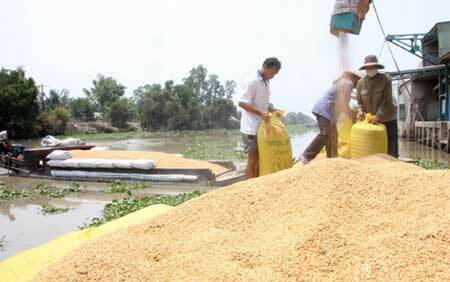 Anh urged rice exporters to strengthen promotions and explore new markets. Bay called for increasing output of high-quality grains to improve export returns. During a meeting in HCM City on Tuesday, the Ministry of Industry and Trade (MoIT) said that the number of rice exporters from now to 2015 would be limited to 150. Deputy Minister Anh said this regulation was contained in a decision signed by the ministry in late August to stabilise and develop rice exports. Phan Van Chinh, head of the Import-Export Department under the ministry, said that exporters would have to meet several criteria to receive certificates to export rice. The company's current rice export results and the locations of rice stores and rice husking mills would all be taken into account, he said. Exporters should also invest in their own raw material areas or work with partners to order and buy rice from farmers according to road maps issued by designated authorities. Chinh said that the regulations on raw material areas were new and were based on proposals from provinces. Exporters will also be required to export at least 10,000 tonnes of rice per year. If they fail to meet this requirement over two consecutive years, exporters will lose their export certificates. They will have the right to reapply one year after the withdrawal of their certificates. If the figure of 150 exporters is reached, then the ministry will stop granting certificates. When an exporter loses its certificate, the ministry will award a certificate to other applicants that meet all requirements, Chinh said. Under the new decision, the number of rice exporters after 2015 will be adjusted based on real export activities and the production and consumption market. The rice exporter plan will be implemented in September and October. All of the assessments of exporters will be done in accordance with the new decision, Tuan Anh said.